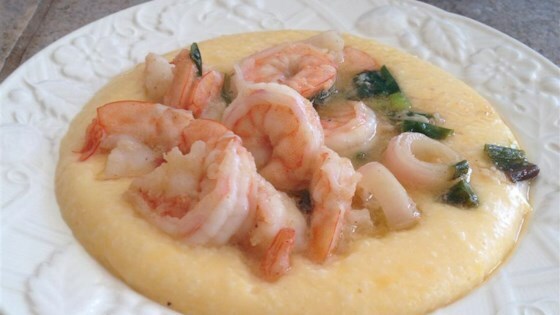 "I have tried a number of shrimp and grits recipes, but have not found one I really like. So I decided to experiment a bit and created a simple but delicious recipe that will surely please the taste buds. In New Orleans we like our cayenne pepper, so use less if you don't like so much heat." Bring water to a boil in a saucepan; stir grits and salt into the boiling water, cover, and reduce heat to low. Simmer grits until tender, 15 to 20 minutes. Remove from heat and keep warm. Melt 1/4 cup butter in a pan over medium heat; cook and stir garlic until softened, about 2 minutes. Stir in green onions, cooking until green onions are wilted, another 4 minutes. Mix shrimp into the garlic and green onions and cook until shrimp are firm and pink, about 5 minutes. Stir in lemon juice, cayenne pepper, salt, and black pepper. Just before serving, mix 1/4 cup butter into the cooked grits, followed by processed cheese. Mix thoroughly until creamy and cheese is melted. Season with salt and black pepper. Place grits in a bowl, top with the shrimp, and pour pan sauce over shrimp and grits to serve. See how to make shrimp and grits the Charleston way. Double, triple recipe as needed. This recipe is enough to serve 2 people generously but will easily convert to more servings. This is the first time I eat shrimp and grits and I don't think I'll try it ever again. The recipe is not bad, but the meal is not for my taste. This was delicious. I added more garlic and was scant on the cayenne since I'm not crazy about hot stuff. I used quick grits which require less water. Overall, an OK dish. I really wish there was just a little more flavor. I kept thinking it needed some more sauce or something to take it up notch. My shrimp and cheese grits came out as if I'd been making them for years!! So delicious! I'm using this method to cook shrimp for salads now, too!